Sophia began her coaching career working as the high school varsity soccer head coach at Pope John XXIII High School in Houston, TX leading them to a TAPPS 3-A State Championship Runner-up. Sophia coached professionally for Development Academy Member Tophat Soccer Club in Atlanta in 2010 while playing professionally with the Atlanta Beat. She coached professionally for ECNL Member Challenge Soccer Club in Houston from August 2009 - Summer 2012. 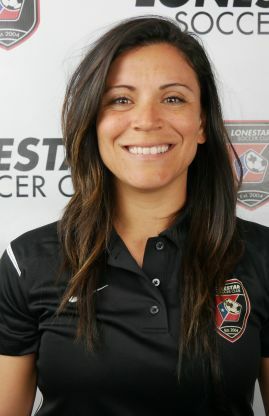 She moved to Austin and has coached full time with Lonestar Soccer Club since August 2012, having served as the DA Girls Coordinator for the last year. Houston, Tx, Sophia Mundy had a distinguished high school career where she played at St. Pius X High School. She was 1st Team All-State and 1st Team All-District four years in a row. Sophia played club soccer in Katy, Tx and was a member of the South Texas ODP State Team from 1999-2002 and was on the Region III Team from 2000-2001. Sophia played for Portland State University for two years before finishing her collegiate career at the University of Houston. Sophia received individual recognition as a four-time All-Conference player, an NSCAA/Adidas and Soccerbuzz All-Central Region Player and in 2006 was named the Conference USA Preseason Offensive Player of the Year. She was also a member of the U-21 and U-23 US Women's National Team Player Pools. After college she played two seasons in the Premiership in Iceland for Afturelding and Valur FC. Sophia then went on to play professionally in the WPS (Women’s Professional Soccer) for the Boston Breakers (2009) and the Atlanta Beat (2010). Sophia played alongside current and former World Cup and USWNT players such as Amy Rodriguez, Kristine Lilly, Heather Mitts, Angela Hucles, Tobin Heath and Hope Solo.